Though the Saturday game against regional rivals Nantes didn’t begin before 8pm, fans began gathering early in the afternoon in central Bordeaux. It was a picnic-alike reunion to celebrate their last game at Stade Chaban-Delmas, or as it’s more commonly known – Lescure. After 5pm the thickening crowd (organisers estimate it to be 8,000) began marching towards the stadium. What usually takes 20 minutes (under 2km), this time lasted over twice that time as fans were stopping and chanting numerous times. Worth noting, it was a very peaceful and diverse march with children and elderly, though loud and festive. 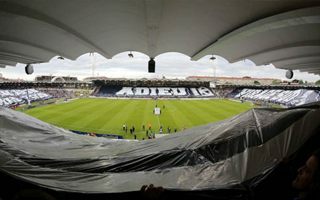 And it was led by a large banner saying “Adieu Lescure”. If any incident, one might mention flares, which organisers asked not to light as they were obliged to. However, the appeal was greeted with laughter and, yes, flares. As they reached the stadium, marchers dispersed to their respective sections of Lescure. Virage Sud, the heart of Girondins’ support, began singing long before the game. Once players entered the field, they were greeted with four large banners covering most of the fans. Dates of first and last games were displayed in the north, “Adieu Lescure” covered east and west stands, while Virage Sud simply had a Virage Sud sign over their heads. And rightly so, because they (mostly Ultramarines 87 to our knowledge) were the ones to prepare all choreographies for the game. Later they displayed painted images of historical scenes from Lescure’s history and created colourful displays with small blue-white flags and ended the game with a large flare launching. Some flares went to the players as they celebrated the 2:1 win over Nantes in a perfect evening, in front of 31,495 people (sell out). After 77 years at Lescure Girondings are moving to the new Stade Atlantique, or as it’s currently called: Nouveau stade de Bordeaux (New Bordeaux Stadium). Built to host Euro 2016, the stadium is larger and more football-oriented than the previously-athletic Lescure. It’s also one of the most original stadiums aesthetically and should boost Girondins’ revenue. First test on May 23, when Montpellier come to seal the season. Are there any disadvantages of the new stadium? If any, distance from the centre is one. Lescure is within walking distance for many residents, while the new arena lies in northern outskirts, some 7km from the old town square. Also, pricing goes up, as is usually the case. Cheapest season tickets begin at €160, while it was €130 this season. Still, football is rather affordable in Bordeaux. As for the old stadium, it’s not going anywhere. Chaban-Delmas will now serve as a rugby venue to the local Union Bordeaux Bègles. Capacity will be reduced to 25,000, because that’s the demand for rugby games. And for top fixtures the side will move north, because the Euro 2016 stadium offers foldable first rows and can fit a rugby field.